Father’s Day 2018: Where can dad eat free, get a discount on meals? Father’s Day is Sunday, and it’s time to show dad some love -- or at least a decent meal that he doesn’t have to pay for. If you are looking to take your dad out on his special day, below is a list of some meal deals and freebies crafted just for him. Arooga’s Grille House & Sports Bar: Dads eat free at participating locations on Father’s Day with the purchase of another meal of equal or greater value. Offer doesn’t include wings or daily specials. You must purchase a beverage. Baskin Robbins: Get $3 off ice cream cakes or cookie cakes valued at $15 or more. Order in-shop or online. Offer excludes the Polar Pizza Ice Cream Treat. Print the official offer coupon or use code CAKE at checkout online. Beef ‘O’ Brady’s: Dads eat free Sunday with a purchase of a meal of equal or greater value, up to $10. California Pizza Kitchen: California Pizza Kitchen is offering a dine-in Father’s Day prix-fixe menu for $49.99 Friday, Saturday and Sunday. The deal includes guests’ choice of small plates, entrees and dessert from the Father’s Day menu. 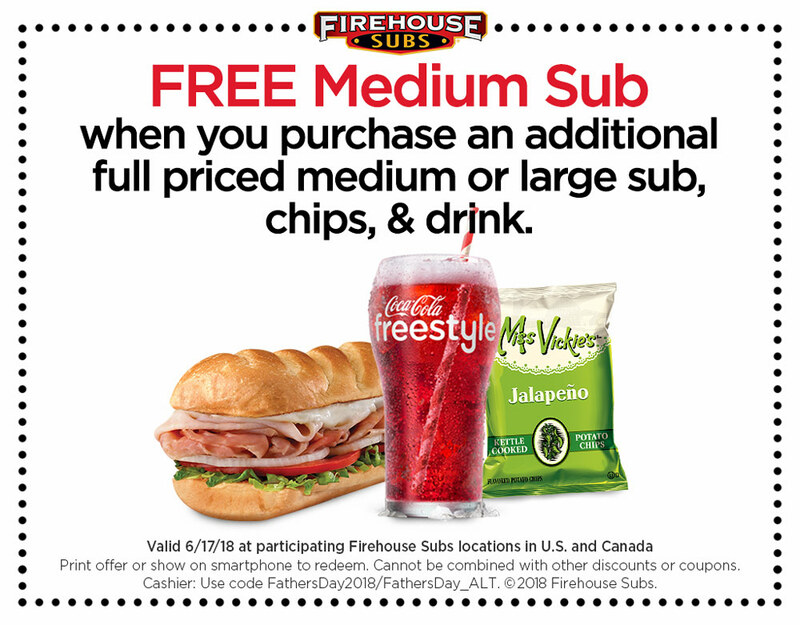 Firehouse Subs: Dad can get a free medium sub on Father’s Day with the purchase of an additional medium or large sub, side and drink. Print the coupon offer or show it on your smartphone to redeem. Fleming’s Prime Steakhouse & Wine Bar: If your dad likes steak, a lot of it, here’s a deal for him. Fleming’s is offering a 35 oz. Tomahawk Steak Dinner for $90. Dinner comes with salad and choice of dessert. A “Bourbon Tasting Experience” can be added for an additional $20. Available Friday through Sunday. Hooters: Ten free boneless wings for dad with the purchase of any 10 wings on Sunday. Medieval Times: Dad gets in free with the purchase of one full-priced adult ticket. Offer is valid between now through Sunday. Use Code DAD18 when buying tickets online. Mimi’s Cafe: Dads can get a coupon for a free breakfast, lunch or dinner entree on their next visit. Purchase of a second entrée of equal or greater value and two beverages is required on that visit. Offer can be redeemed through July 7, 2018. Morton’s The Steakhouse: Morton’s is featuring a three-course Father’s Day menu on Sunday for $59 per person that includes a choice of salad, entree and dessert from a select menu. Entree choices include filet mignon, prime pork chop, and salmon. Click here for more details. Outback Steak House: Outback has steak and surf and turf specials on Father’s Day. See the Outback Father’s Day Menu for more details. Ruth’s Chris Steak House: Dine in on Saturday or Sunday and your dad can get a $25 dining card, good for a future visit. Cards are valid through Aug. 31, 2018. Limit one per table. Spaghetti Warehouse: On Sunday, dad can get a free 15-Layer Lasagna or any Original Recipe spaghetti entrée. Dine-in parties only. Two free meals per party/table. Some restrictions apply. Click here for details. Sonny’s BBQ: Sonny’s is offering dad an all-you-can-eat baby back ribs deal for $18.99 on Father’s Day. Dine-in only. Tony Roma’s: On Saturday and Sunday, Tony Roma’s will offer the $35 Father’s Day menu, which includes a 12 oz. New York Strip topped with Kickin’ Shrimp, choice of salad or soup, and a fresh vegetable. See details. Wienerschnitzel: Dads get a free Old Fashion Sundae on Sunday.